I donut know if you've noticed, (HA!) but donuts are all over the stamping industry right now. Lots of companies have donut products which is great if you like donuts and I love a good donut. There was a Dunkin' Donuts on my way to work in Arizona. Thankfully, I used self-control almost all of the time and drove right past it. However, when my parents came to visit, it was a tradition that the first morning they were there, whoever woke up first would go get us fresh donuts. You had to get there early to get a good selection. They were delicious. I wish I had one right now! This donut was made by the company Reverse Confetti. It's a super cute die cut, but not nearly as tasty. It did let me live out my dream to be a baker and "frost" my donut, though. I used white embossing paste and put it right on my frosting die cut to give the look of real frosting. I didn't put it on very neatly, on purpose, so it would have texture like real frosting. I put adhesive on the back of my card stock before I die cut the little sprinkles, but I think the embossing paste would have held them in place when it was wet. I sponged a little bit of ink around the edge of my donut since a real donut wouldn't be the exact same color all the way around the edge. The frosting and sprinkles on top made the perfect donut for my card. The sentiment comes from a Reverse Confetti stamp set called "Donut You Know." They have several cute donut sayings in it and you can stamp your sprinkles on the frosting die cut instead of cutting them out, if you'd prefer. This would have been faster, but not as cute. Stampin' Up made all of the card stock and matching patterned papers. I love it that they have matching card stock for their patterned papers, as well as other goodies like ink, ribbon and buttons so you don't have to spend hours trying to find a match, especially on nights like tonight when I'm tired! I made this card for an amazing friend. We met in college, lost touch for awhile, but have been talking again for the last six months or so. She has been a huge support during all of this with my back. Unfortunately, her husband has gone through similar problems. She has truly been a gift from God and I don't know how I would have gotten through all of this without her. This will be the perfect card to send her. Thanks to Reverse Confetti for making the perfect products for it! I am entering my card in three challenges. 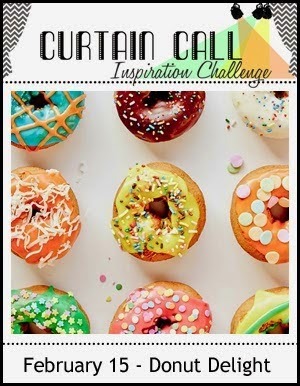 First, I am entering it in the Curtain Call Inspiration Challenge which is Donut Delight. Be careful if you're hungry, because there are some good looking donuts there! ﻿My card design came from the sketch at Reverse Confetti's blog. 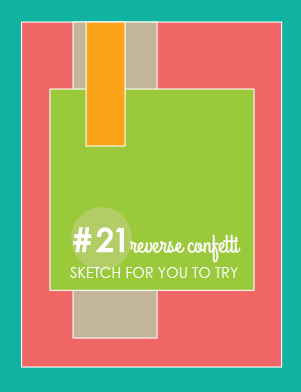 Each month, they have a challenge called "Reverse Confetti Sketch For You To Try." I did try, although I didn't follow it exactly. I've said that a lot lately. My sentiment and donut ended up being a rectangle instead of a square and I didn't want to cover up any of my words with any of the paper. I used Reverse Confetti's products though which were great, so I wanted to share the card I made with them. 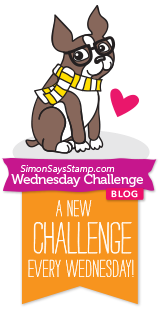 Finally, I am entering my card in the Simon Says Stamp Wednesday Challenge to Add a Little Texture. My donut frosting adds a lot of texture to this card. Now, I need to go find something healthy to eat since all I'm thinking about are donuts! Thanks for playing with us at Curtain Call AND Reverse Confetti...your card is delish!